Content by Tony Macklin. Originally published on March 18, 2019 @ tonymacklin.net. The Things We've Seen is an evocative movie. It is visually effective. It opens with galvanic imagery. A mill in a small town at night is going up in flames, and the police and a group of men in a house have a violent shoot-out. The leader Rayford (Randy Ryan) and his wounded brother (Jordan Hodges) escape. They and their family are shattered by the fire. The mill's destruction means the town has lost jobs that kept it going. Rayford is on the run in a dying town. The strength of The Things We've Seen is its visual quality (cinematography by Steven Turco). But the dramatic force doesn't quite keep up with the arresting imagery. The film is not as compelling as it might have been, because there are few scenes that have dramatic heft. It is a film of fading tension. The acting keeps it going, especially Randy Ryan. He exudes an image that is cool and sensitive. His sons (Jarrett Maier and Noah McCarthy-Slaughter) are fresh-faced young men under duress. The Things We've Seen is about relationships, but some of the scenes between various characters lack solid impact. The wife's (Shani Saylers Stiles) slaps are weak, and her character lacks substance. Some of it has to do with the screenplay by director T.A. Manchester. Most of the conversations are limited (a rewriting would have helped). 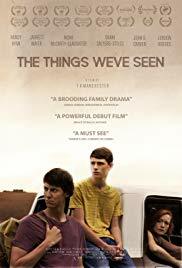 The movie's title, The Things We've Seen, is lackluster, and the delivery of the title scene is a bit garbled. The screenplay mostly seems rote. A radio announcer says, "What will become of our little town?" Would he say that? At times The Things We've Seen falters in its thematic intentions. Family, home, loyalty, and identity at times get blunted. A greater dose of tension would help. The direction by Manchester is able. It has polish, but at times the substance beneath the surface is too understated. It could be sharper and deeper. But a filmmaker with a visual sense is halfway home. T.A. Manchester is on that road.